We have two lots on the 6th Street side of the church. Street parking is also available. Please do not park in the post office lot, or you may be ticketed and towed. 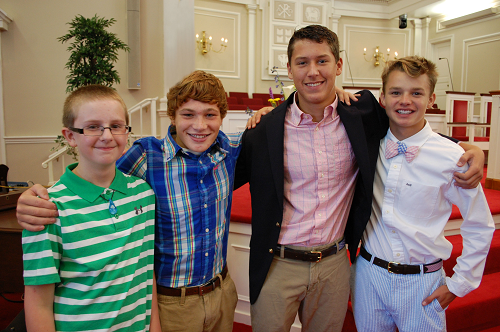 At First Baptist, you will find people dressed in everything from jeans and polo shirts to business suits. At our 8:45 service people tend to dress more casually (jeans, etc. ), while at our 11:00 service you will see more people wearing traditional “Sunday” dress. If you come to Sunday School, you will find a mix of all of these. Please dress in whatever makes you feel comfortable for engaging in genuine worship and community. You will not be judged. What is worship like at First Baptist? We are committed to thoughtful worship that generally follows the seasons of the Christian year. Our 8:45 service is informal and has a praise ensemble that leads music. Our 11:00 service is more traditional with a choir and an organ. The elements of worship (music, readings, children’s time, sermon, etc.) are crafted around the Scriptures and themes of the day. For more on our theology of worship and our two services, see our worship page. Extended Session care is provided for infants, toddlers, and preschoolers during both worship services. Children ages 3-5 attend the first part of the service, then go to Extended Session after the children’s sermon and remain there for the duration of the service. Elementary-aged children (1st grade and up) attend worship with their families. Sunday School classes for children are age-graded, from infants through 6th grade. Sunday School is from 9:45-10:45; parents are invited to adult classes during the same hour. Please see our children’s ministry page for more information about children’s programming on Sunday morning. We are moderate Baptists. We partner with various organizations including CBF and CBFNC. Please see our Baptist Identity page for more information.